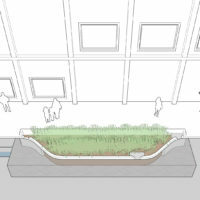 The green stormwater infrastructure toolbox includes a variety of design elements, which must be selected, sized, and configured to meet the goals and context of the project site. 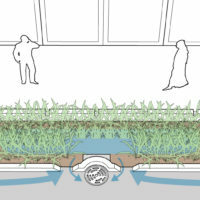 Bioretention planters are stormwater infiltration cells constructed with walled vertical sides, a flat bottom area, and a large surface capacity to capture, treat, and manage stormwater runoff from the street. 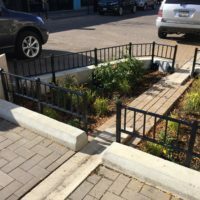 Biofiltration planters provide water quality treatment and reduce runoff volumes, and may be applied in more limited rights-of-way. 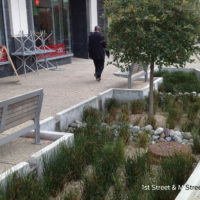 Bioretention swales are shallow, vegetated, landscaped depressions with sloped sides. 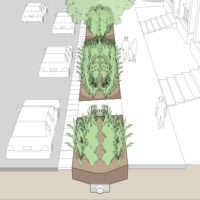 A hybrid bioretention cell combines elements of both swales and planters, featuring a walled side opposite a graded side slope to increase vegetated space and infiltrating area, while providing a softer streetscape treatment for people walking. 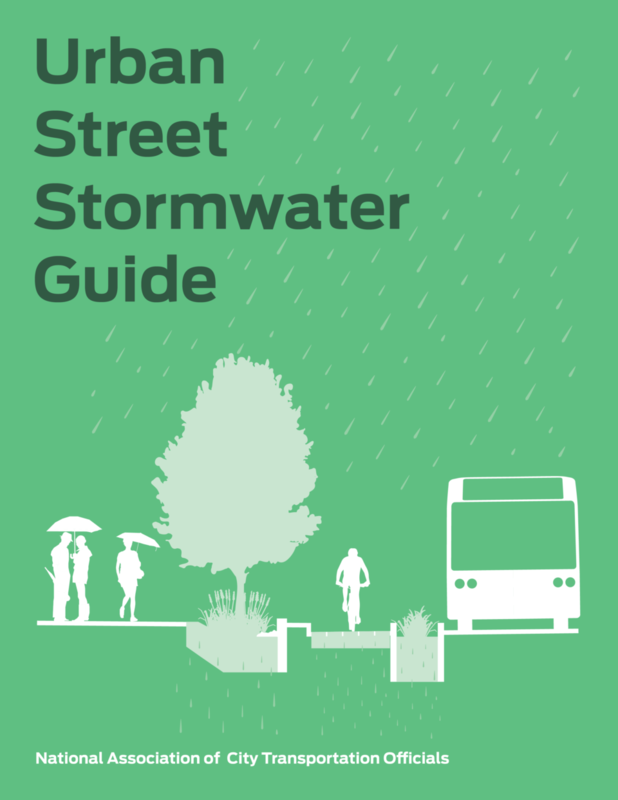 Healthy street trees can contribute significantly to green stormwater management, with large capacity to transpire water, intercept rainfall, and treat water quality. 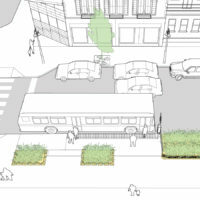 Decreasing the amount of impervious surface cover through the use of permeable pavement materials allows water to infiltrate through streets and sidewalks, reducing runoff. 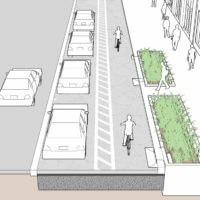 As new design tools and best practices have emerged to improve multi-modal safety and accessibility on urban streets, new spaces have been revealed where green infrastructure can achieve both environmental and mobility goals. 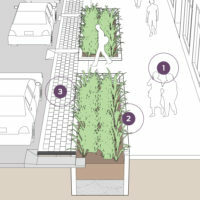 The available space generated by curb extensions can be used for bioretention, plantings, street furniture, benches, and street trees. 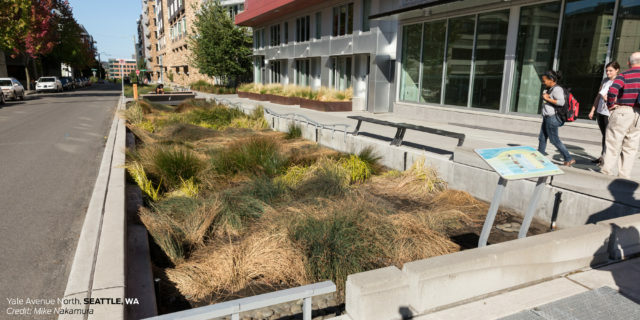 Incorporating stormwater facilities at transit stops introduces new opportunities for mutual benefits and inter-agency collaboration, unlocking new project funding sources and leveraging complementary resources. 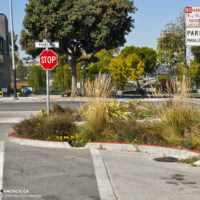 Vegetated space on pedestrian refuge islands, bikeway buffers, transit boarding islands, or other constructed elements that are offset from the curb can improve the streetscape and provide space for street trees. 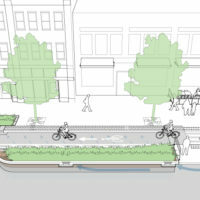 Wide medians used to separate traffic directions may be utilized for large amounts of water conveyance and infiltration. 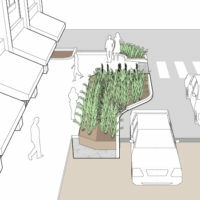 Site and design bioretention cells with sensitivity and consideration for local context and the performance needs of each project within the stormwater network. 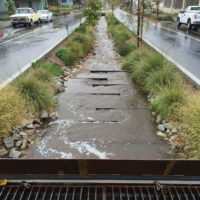 How large a cell needs to be depends on the stormwater management goals for the facility and the space available in the right-of-way. 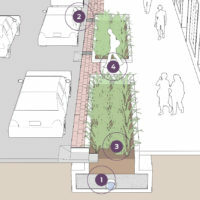 Inlets convey stormwater runoff from the surrounding street catchment area into the bioretention facility. 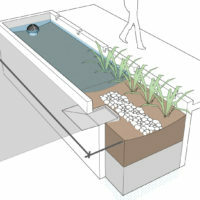 Details of inlet design—including width, grade, and location—guide the stormwater into and out of the stormwater cell. 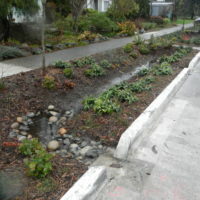 A presettling zone is an area made of cobbles or concrete that captures debris, pollution, and sediment at the upstream end of a bioretention facility. 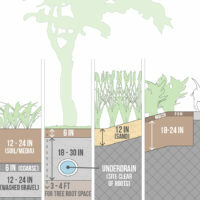 Soil characteristics should be chosen to support drainage, pollutant removal rates, and plant health and viability. 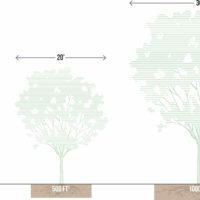 Plantings should include a diverse community of native species.